I've long felt that the Kircher tree of life is somewhat arbitrary and could be improved, but I've had difficulty breaking out of that tradition simply because that glyph had become so overwhelmingly popular as to be almost standard. I don't necessarily think that there exists a single correct model, so I've always felt that the arbitrariness of the Kircher tree ought to be more or less outweighed by the near-universal acceptance it receives. I've also done some work with the Lurianic and Gra trees (the latter being a personal favorite), and have developed my own version of the tree akin to a Gra tree with slightly different correspondences on the vertical paths. One difficulty I have, though, is that regardless of which tree I'm working with, it feels incomplete. (Part of this may be the absence of the Qliphoth; I'm aware of them hovering in the periphery of my vision, waiting to be explored, but haven't yet done any in-depth work with them and don't expect to do so for several more years to come). The Qliphoth aside, I think that one of the main reasons I feel like something is always lacking is that the trees have wildly different but equally valid representations of the relationship between man and the divine. The Gra tree is all well and good for balance, but it's crap when it comes to exploring the archetype of the Fall. So my question: do any of you juggle multiple versions of the Tree of Life and work with them separately? If so, how do you balance them? Or do you prefer to just pick a single tree and stick to it (and if this is the case, have you never felt like your tree was lacking)? I think any model of the Tree may seem lacking in something: the dynamic aspect, which requires more than two or even three dimensions. It seems such a fixed, static structure, that it is easy to overlook the continual interaction of influences between the Sephirot, which do not necessarily even follow the connecting paths. I have no problem with the Kircher. It serves as a model for creation as well as the return path. Considerations of elegance and symmetry aside, it works for me. Sometimes it is forgotten that the Tree is only a model of reality, not an invariant representation of the Thing itself. Thanks for your reply. The two-dimensional nature of the Tree of Life as a limitation on its representative power is definitely a good point, although I personally am not in love with the Cube of Space or attempts that I've seen at three-dimensional trees. Thanks also for your remark on Kircher. I definitely agree that it's important to remember that the Tree of Life is just a symbol to represent the world; I just can't escape the nagging feeling that it needs improvement. Maybe that says something about my perceptions of reality. I don't, I've never felt the need to. Somehow I don't see the Kirtcher as arbitrary, it has an internal consistency and poetry that is quite lovely. In any case, I think that what model one uses is, in this case, less important than what one does with it. The GD attributions are not only popular, but are inextricably connected to the rest of the their magickal system, so it is good to base oneself on a common model. I think that one day I will venture out to other Trees, but at the rate of my studies, it will take me a few years. I'm not in a hurry. Plus, until I really understand, at least to my own standards and competency, the ins and outs of a single Tree, I don't really feel qualified to study two or more simultaneously. I suppose part of my difficulty is derived from the fact that I don't practice magick, so the use and symmetry if the tree for those purposes really don't apply to me. I use the Tree of Life much more as a tool for introspection, and I'm that sense--without a magickal grounding to make it seem consistent--the Kircher tree just looks and feels fundamentally imbalanced to me. It's so inextricably linked with one model of the human psyche, which I feel is only partially applicable and by no means complete. I do agree with the usefulness of working from a common model--any kind of symbology is essentially useless if it's not consistent with the outside world, unless you're confident that your work is exclusively personal and will never need to be seen or interpreted by someone else. This is the reason I've kept Kircher around for as long as I have. But honestly, the glyph doesn't work for me, and I feel that if I'm going to use it, I would need to balance out some of its asymmetry by simultaneously working with a complementary Tree (e.g. the Lurianic). Well, I'm assuming you're interested in Tarot, if you're here, and the Tree can be used very well with it, independently of how they are used. They can serve as important study aids to see and analyze its ins and outs even if you're not doing practical work. For example, right now I'm studying the Devil, which is opposite Death. You get to thinking why this is. Nun means fish, which has a myriad of meanings. It is connected with rotting and putrefaction, basically what earth is made of. It has the sexual connotation of sperm, so we've got fertility and fecundity. The end of one stage is the beginning of another, all joined. The Devil is opposite that, and on one hand balances Death by being, as the Golden Dawn called him, the Lord of the Gates of Matter, which is connected to thresholds, the womb, etc. I've read interpretations of the Eye (ayn) actually refers to the urethra, itself having the shape of an eye, out of which come the male's "children." One stage leading to another, etc. Both are transformative cards, polar opposites on one hand, yet the identical after another fashion on the other. You could also go further, and look at Lamed, Justice. The Devil is cause while Justice counterbalances that with effect. Justice is in itself balanced by Yod, which mirrors both Nun and Ayn. So, those are the kind of games I play with the Tree. It is very introspective and quite enjoyable. As you said, the Tree is one person's model of the universe. It's basically shorthand for a complete philosophy. Whether you agree with it or not, merely working out the model is a great grinding stone for the mind. I wonder, though, why do you say it is arbitrary? I'm asking because I've heard the same from others in the past. I agree that you can exploit the structure of the Kircher Tree to make some interesting connections between various cards of the Major Arcana. This can be done with any version of the Tree of Life. But a few of the reasons I feel it's arbitrary are as follows. First off, let's just look at the bottom-heavy structure of it. 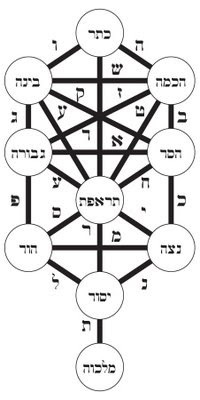 This serves a double purpose--it leaves room for the invisible eleventh Sephirah, Daath, and it shifts the emphasis of the Tree of Life downwards towards the more materialistic base (rather than the divine crown). This can represent the struggle of humanity to reconnect with the divine after the Fall, sure, but aren't there other ways to illustrate that relationship? The emphasis that Kircher places on the base of the Tree of Life reeks to me of a Calvinistic original-sin model of human nature. Compare it with this top-heavy tree, which places more emphasis on the divine and sees the material world as a seed out of which divine knowledge grows. (It's more complicated than that, but you see the fundamental inversion in the way the tree approaches humanity and its relationship to the divine.) Or this one, which presents the material and immaterial realms as equal and balanced. These differences in the way you frame any work with the Tree are, I think, fundamental influences on the outcome of that work, and that's why I'm suspicious of using only one. Then let's talk about the way that cards are assigned to the Kircher tree. You just start at your top with the Fool and work your way down to the World at the bottom in numerical order, without any regard for the individual meanings of the cards, their astrological associations, or even the Kabbalistic meanings of the letters associated with them in texts like the Sepher Yetzirah. And, well... Doesn't that feel a bit silly? Yes, with some of them, you get a meaningful placement--it makes sense for both the Emperor and the Hierophant to be on the masculine right side, connected to the Pillar of Mercy--but with other cases, it just seems so forced. The Moon on the masculine side of the Tree? And the Tower between Netzach and Hod? Really? I understand that with enough work, you can probably derive something meaningful from looking at those correspondences, but there's also a certain point where you're trying to fit a square peg into a round hole, and I at least have asked myself numerous times if there wasn't a better way to do it. Let's look back at the Lurianic tree (the first of the ones I've linked here). Rather than going from Aleph to Tau, this model splits the alephbet up into the Mother letters, the Single letters, and the Double letters, as outlined in the Sepher Yetzirah. It puts the three Mother letters on the three horizontal paths, the seven Doubles on the seven vertical paths, and the twelve Singles on the twelve diagonal paths. In my opinion, this presents a more consistent and coherent internal logic for the placement of the letters, at least, if not for the cards. Now, of course, this model has its issues, too. The Sepher Yetzirah provides a framework for the ordering of the Mothers, but with the Single letters, it once again starts at the top and just works its way down the alephbet (following the signs of the Zodiac as well). The same thing for the Double letters, which are assigned according to the Chaldean order of the planets--but then we have to ask ourselves whether we're using Sepher Yetzirah or GD planetary correspondences. And, for example, the placement of the Hanged Man in the position formerly occupied by the Tower seems just as problematic to me. But I can at least follow and justify the placement with a bit more complexity of thought than just going from א to ת. And if you look at the Lurianic or Gra trees here, you can still find useful thought-provoking structures. Death is still opposite Justice, but now the Devil is opposite Strength (a very interesting combination). And honestly, I think you could derive interesting material from the structural pairing of any two Major Arcana cards, so just because this can be done with any one tree doesn't in any way make that tree complete or sufficient. I agree that, as LRichard pointed out, the Tree of Life is just a two-dimensional glyph and is always going to be incomplete in some respects when it comes to representing the complexity of the universe and the human psyche. And furthermore, I acknowledge that all of these models are human devices and are going to be flawed to some extent because they're created by (flawed) people; I don't believe that there's any divine truth waiting to be distilled down into a single image. But I'm not really satisfied with resigning myself to that incompleteness, and to me, it seems that the best way to move past it is to work with multiple trees in conjunction in the hope that their respective flaws will balance each other out. And finally (in a bit of a deviation, but while we're talking about associations with the Tree of Life and how I often feel they're arbitrary), I really can't get behind the magickal correspondences given for the Tree in Liber 777. No reasoning is presented for them to be as they're given--no prior sources, no logical explanation for why things should be ordered a certain way. I admit I haven't read enough Judaic theology to know if there is, in fact, a grounding there for the angels and names of God as they're connected to the Tree in that book, but I feel that I can say with confidence that his correspondences for gems, plants, animals, and the like look like they came out of thin air (or perhaps an opium dream). I understand the argument that these correspondences are not necessarily external divine truths, but rather tools that can be used to focus a practitioner's mind during magickal work, but, well, I have trouble buying it. This is much less relevant to me, because, as I said, I don't practice magick, but it's definitely contributed to a larger sense of overall suspicion regarding Kabbalistic correspondences and the way they're presented and accepted as invariable (and, really, axiomatic) even though there's often not much explanation behind why things should be the way they're given. I have used the kirscher tree, the qlippoth tree and Isaac Luria's tree and for me, using the different models helps me discern what I find arbitrary or not. The qlippoth tree corresponded to kirscher's, but was a way of balancing out the two dimensional feeling of Kirscher's. Another approach which I found interesting by difference was Samael Aun Weor who attributes the major arcana to the sephiroth, using gematria for numbers above 10. His deck and approach differ radically from the GD and Luria's, but are steeped in the same occult symbolism, Tetragrammaton, Kabbalah etc. I began by grounding myself in Crowley's model, but as you say, this was at least in part due to the correspondences that are available for that particular tree. Working with the other trees and Samael's different approach has broadened my thoughts towards Crowley's model and has been helpful in offering alternative perspectives, but I do tend to only work with one tree at a time just to be kind to the pea brain. For me it helps in a 'you must create your own system or be enslaved by another man's' kind of way. Another approach which I found interesting by difference was Samael Aun Weor who attributes the major arcana to the sephiroth, using gematria for numbers above 10. His deck and approach differ radically from the GD and Luria's, but are steeped in the same occult symbolism, Tetragrammaton, Kabbalah etc. For me it helps in 'you must create your own system or be enslaved by another man's' way. I'm just trying (probably badly) to indicate how any version of the Tree may seem to be "lacking" somehow, whereas it may be perfectly valid within its inherent diagrammatical limitations. As for me, I'm presently satisfied with the Golden Dawn's adaptation of the Kircher Tree.